Violin and piano recital at the YMCA Invergordon – taken by flashlight. 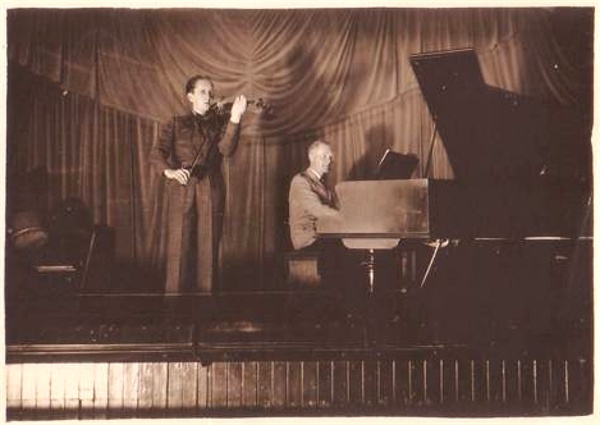 Alick the Polish violinist is playing (date unknown). I remember the stage with the grand piano and grey velvet curtains. Alec's name sounded like "Sigarek" but I doubt if this spelling is accurate. He was a very talented classical violinist who gave private lessons in Chapman's Hotel. He married "Madgie" Chapman, daughter of the owner. He later became a violin instructor in the Ross-shire schools. My brother and I went to Alec for violin lessons for several years. He showed great patience in spite of our lack of application. Gordon, help my memory here. Where was Chapman's Hotel? There were several small "Temperance" Hotels in Invergordon. These were not permitted to sell alcohol, since the Cromarty Firth area was under "State Control", (as was Inverary). This was a device instituted by the Government to ensure that all the money spent in the pubs by the Service personnel went straight back to the Exchequer. The only hotel allowed to serve drink was the Royal Hotel. Some time after the war the State Control was phased out and certain Hotels were granted a Table License, allowing them to serve drink with a meal. The first such was the Salson Hotel, ex McLaren's Hotel. The Temperance hotels in the 1940s to 1950s were:- The Rhu (Mrs Tutton and Lilian), MacLaren's Hotel, Bisset's Hotel and Chapman's Hotel. Chapman's Hotel was on the south side of the High Street near to or next to Willie MacIntosh the newsagent's shop, on the corner of the High Street and School Lane, which shop was taken over by Mr Strachan. I had just learned to "go the bike" and I "borrowed" a big ladies' bike from Mary MacLean and set off down the High Street standing on the pedals. I attempted to turn at speed into School Lane and crashed into the wall. When I regained consciousness, it was to find "Madgie" Chapman bending over me. She took me into the hotel and brought me a plate of strawberries as compensation for my almost severed ear. I have always been grateful for her kindness and concern. I can't remember apologising to Mary MacLean for wrecking her bike. Chapman's Hotel was near the house of Jim Maclennan and nearly opposite Maclaren's Temperance Hotel. Re location of Chapman's Hotel, Janet, your memory is better than mine. Gordon, your comments are interesting, on all of the pictures. Janet, you are right regarding the location of Chapman's Hotel. Gordon, your brother, Martin, was in the same class as me at school. Was there a Mackintosh Temperance Hotel in Invergordon too?